On Tuesday 24 April 2012, JCC President Afra Raymond addressed the POS Rotary Club at their luncheon on ‘The Imperative of Public Procurement – The Government to Government Arrangements‘ – the Power Point presentation is shown here. On Tuesday 10 April 2012, JCC President Afra Raymond appeared on CNC3 with Hema Ramkissoon and UWI-based Political Scientist Dr. Hamid Ghany to discuss ‘Governance and Government’. 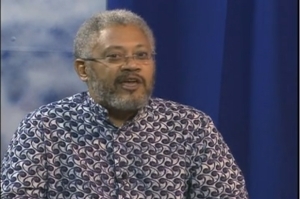 Afra Raymond, in his capacity as JCC President, speaks on Procurement revelations in the Parliamentary debate on No-Confidence in the Prime Minister on First Up with Paul Richards and Jessie-May Ventour. The transcripts of my testimony are located here. It is really instructive to consider the various arguments put forward by these parties in an attempt to limit my testimony and ultimately to deny it the benefit of clear illustration via PowerPoint. There is going to be a real struggle to show the information on this series of financial and economic crimes. That information needs to be shown in as digestible a form as possible, which was the point of my presentation. Between the strong opposition of the parties who were at the centre of the crisis and the refusal of the government to fund multi-media facilities, we have a fight on our hands to get at the facts. Afra Raymond is interviewed on the “Caribbeana” show on WPFW in Washington, DC, hosted by Von Martin on the CL Financial Bailout, the Colman Commission and the revelations and possible consequences. Afra Raymond is interviewed along with Baba Elombe Mottley of Jamaica on the “Checkpoint Caribbean” show on the Caribbean Superstation, hosted by David Ellis on the Colman Commission and the revelations and possible consequences. Afra Raymond is interviewed on the “Centre Stage” show on Power 102 FM in Trinidad and Tobago, hosted by Chris Seon, Cliff Learmond and Sherma Wilson, on the Colman Commission and the revelations and possible consequences. Afra Raymond sits down with Jessie May Ventour and Fazir Mohammed to speak on Transportation Logistics, Challenges and Implementation in Trinidad and Tobago. Afra Raymond sits down with Jessie May Ventour and Fazir Mohammed for a discussion on the new initiative by the new Government to the ongoing CL Financial bailout. Afra Raymond sits down with Jessie May Ventour and Derek Ramsamooj for a discussion of matters pertaining to the CLICO and CL Fianacial bailout prior to the national elections. Afra Raymond sits down with Jessie May Ventour and Derek Ramsamooj for a discussion of matters pertaining to the construction industry prior to the national elections. Topics include UDeCOTT, the controversial Guanapo church and the Uff Commission Report. Afra Raymond sits down with Paolo Kernahan on CNC3 Early Morning Show to discuss the CL Financial Bailout one year later. Jerry George, a freelance journalist from St Vincent and the Grenadines (SVG) has been following and reporting on the the CLICO/British American Story and its impact on the Eastern Caribbean countries. He came to Trinidad to interview Afra Raymond on the 1st anniversary of the bailout. Jerry is the Host and Producer of UP NEXT! which is aired on SVGTV in St Vincent and the Grenadines. Video courtesy UP NEXT! with Jerry George. Fazeer Mohammed and Jessie May Ventour interview Afra Raymond on the simulcast of First Up on Talk City 91.9 FM radio and C Television on the topic, “What’s the Deal with CL Financial” touching on the continued silence of the professional class, politicians and labour unions on the ongoing debacle of the CL Financial bailout. Video courtesy Caribbean New Media Group Limited. This is a podcast Afra Raymond did while in New York on Thursday 14th January at the offices of RICS Americas, the regional HQ of the international professional body, the Royal Institution of Chartered Surveyors. the Uff Commission of Enquiry into the Public Sector Construction Industry. He concluded by reminding listeners that the RICS’ principal cause was that of “serving the public interest” and that that was one of the main engines for him as a campaigning surveyor.